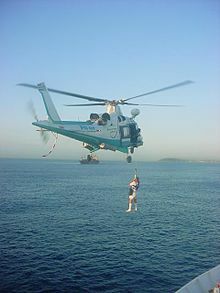 Normally, the pilot joins an incoming ship prior to the ship's entry into the shallow water at the designated "pilot boarding area" via helicopter or pilot boat and climbs a pilot ladder sometimes up to 40 feet (~12 metres) to the deck of the largest container and tanker ships. Climbing the pilot ladder can be dangerous, even more so in rough seas considering that both the ship to be piloted and the pilot's own vessel are usually both moving. 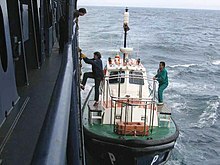 With outgoing vessels, a pilot boat returns the pilot to land after the ship has successfully negotiated coastal waters. This page was last edited on 7 April 2019, at 05:06 (UTC).